A few weeks ago, Callie from CityCraft contacted me about designing a quilt with Kona's new solids - all 32 of them. I was thrilled and so excited for the opportunity, but had no idea what I was going to design. Typically for quilting, I like to work with two solids and white, so this was definitely placing me outside of my design comfort zone. But for those of you who know me well, know how much I love a challenge. Game on! Initially, I comped up three designs for Callie and we decided this one was our favorite. The next step was to figure out the quilting math (not my strong suit at all) and construction. I wanted the piecing to be simple as possible, so I used a jelly roll of kona solids in white and fat quarters of the 32 kona colors cut in 2.5in strips. The piecing went relatively well. The only caveat was to figure out how to sew the strips in the two directions consistently. Being a design nerd, I mocked up two diagrams and referenced them constantly when I sewed from row to row. It definitely helped me stay on track and I only had to use my seam ripper once. 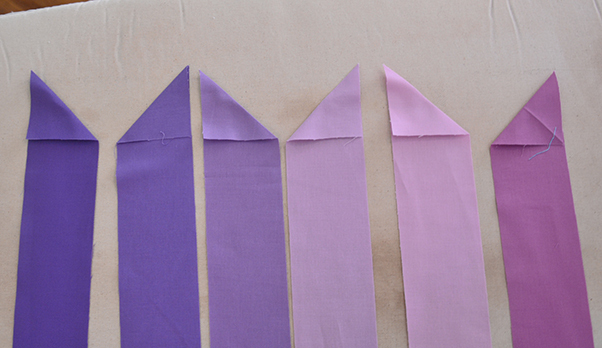 When piecing, I broke up the construction based on the color groups - Neutrals, Greens, Blues, Purples, Pinks, etc - and would iron down the corners in the opposite directions (again based on the diagrams above) so I would have a natural guide when sewing the strips together. Candid shot of Dash looking absolutely thrilled that the quilt top was invading his space. I have to say, I was a bit nervous starting out this project, but I am so happy and proud of how it turned out.